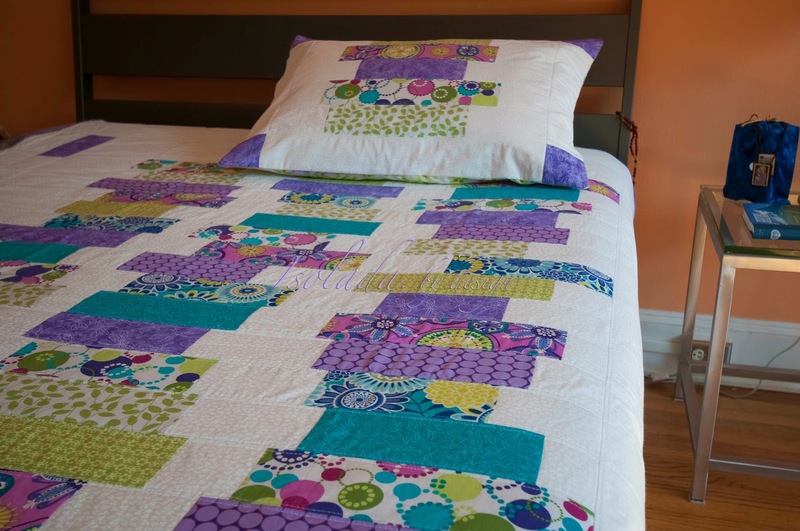 I'm super excited to share my very first twin size quilt and pillow sham! A friend commissioned both after I made a mini with the same color scheme. The mini was a gift for her sister who was re-decorating a room to become her study/quiet space. From the quilt she picked a pretty lavender to paint the walls where the mini was then hung. A twin size bed was going to remain in the room and they wanted the twin/pillow sham to match. 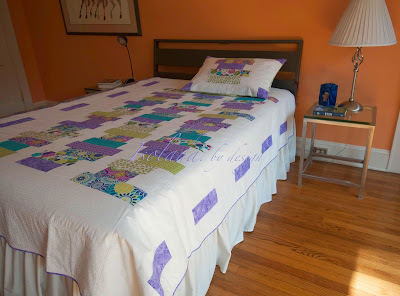 I was a bit concerned with quilting something bigger than anything I had made before. It was a challenge and I can't say there are many more large quilts in my future, but I'm happy with my results. I felt like I needed a few more fabrics since I was designing three stacks and didn't want to repeat the same color/design too many times. I decided to pick up some of the pretty blues to give a pop of color which I thought would also look pretty in contrast to the larger, predominantly purple space (not what you see in these photographs as these were taken in my home, not hers). I kept the same quilting scheme as in the mini, using quilting stitch number 45 on my Brother XR9500PRW which is my favorite. It reminds me of a string of pearls or an embossing. I stitched each row on either side of the ditch then in the ditch around the stacks where I had attached the border. I added a second stitch outside this ditch for decorative purposes and consistency. For the purple blocks in the border I stitched top and bottom...in the ditch and on either side of the ditch. It was a lot of work, but I just love the results of all those quilt lines. Dragonflies are of special significance to these two sisters. They particularly liked the purple dragonfly fabric which is why I thought to add the simple, single blocks in the border which will be visible on both sides of the twin upon entrance into the room. I don't have a twin size bed in my home so I had to improvise to photograph it on a queen size. It was designed so the stacks would cover the top of the mattress only and the pretty, purple border long enough for the height of the mattress. The pillow sham is, I believe, a perfect match. These are happy, pretty colors and definitely a fun pattern! I did my usual computer generated spreadsheet to get my sizes down for the stacks then let the fabric tell me where they should each go. It's a process that works for me!